Cool! I missed out on the Reds, so I’m excited to try these with some halo stems. Just bought these along with halo trues thank you! They are identical to the Red & GSUS Pandas. They’re made with the same specs & in the same factory as GSUS Pandas, the only difference between the three is the color of the housings. Definitely buying if they’re still available next payday. No way, mint all the way! Picked up 90 and 90 halo clears off massderp. Same! I also picked up SPRIT Springs. Which spring weight did you end up getting? Do Yok panda’s experience return issues with the stock springs? No issues with stock springs. A popular pick is 63.5g for some reason. I used that with my red holy pandas but might actually just use the stock springs for my mint ones. I’m going to try lubing the stock ones and see how they feel cause I don’t honestly recall a big difference between them. Cool I’ll look into getting some springs, maybe the 63.5g since thats close to the weight of the Zilent v2’s which are my favorite switch at the moment. On a separate note, Yok Pandas are pretty much indiscernible from the OG Holy Pandas right? 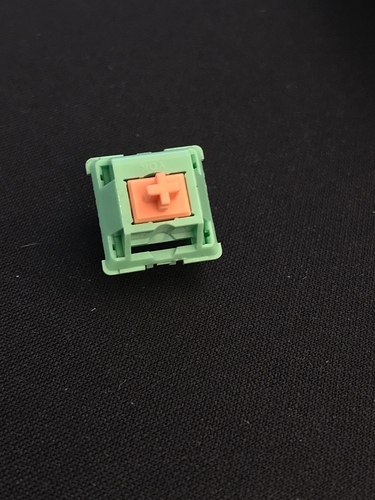 Really into them because I think the tactile event in Zilent and Zealio’s are too sharp and short. That is correct. If there is any difference it’s indiscernible from OG Holy Panda in feel. It’s a nice rounded bump not sharp. Mine came today. They are somehow slightly different. The bump with a halo stem feels a bit sharper than it does on my red YOKs. Also, I feel like it almost catches on the way up. Like the spring is also lighter as well. I’ll spend some more time with them, but for some reason they feel different to me. I will say they feel better with a 72g spring. And once again the housings are huge. Some plates make it a bear to get them in. Here’s a visual of what they look like for those who are wondering. Agreed, the housings do seem to give the stem a little bit of wobble. And once again the housings are huge. Some plates make it a bear to get them in. Yeah. I had to grind down the notches a bit for hotswap boards. Before grinding, it as more gruntswap.